Combining physics and art, the pendulum wave demonstration uses kinetic energy to create a beautiful art display. The simple pendulum, at rest and in motion, demonstrates how a mass accelerates (and decelerates) in response to gravitational force. 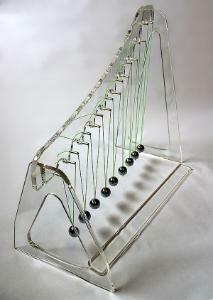 Multiple pendulums, with decreasing string lengths, in motion will simultaneously create changing visual patterns that mesmerize as they move in and out of sync with each other. The pendulum wave demo consists of a large acrylic frame and nine pendula with 1" steel balls, as well as an initiator stick to simultaneously release all pendula. Great product for the classroom, as a gift, or as a display piece.